(Snohomish, WA) We’re fortunate to view of lot of nature’s wonder in the Pacific Northwest. 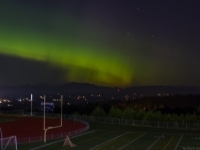 But two prized moments have long eluded me in my 53 years: the site of orcas in Puget Sound, and witnessing the Northern Lights. Well, I can finally cross one of those long-held dreams off the ol’ bucket list. 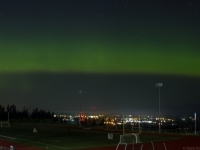 Sure, I’d read the news reports on Saturday, stating that the Northern Lights might be visible during the approaching night. 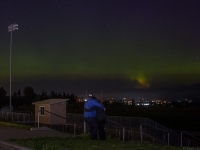 But over the years, I’d chased the Northern Lights on several occasions…without success. So, around the time Saturday was surrendering to Sunday, I was feeling the pull of my couch a tad more than the tug of my camera. Surely, my eyes were wide open now. A few minutes later, and I was out the door. 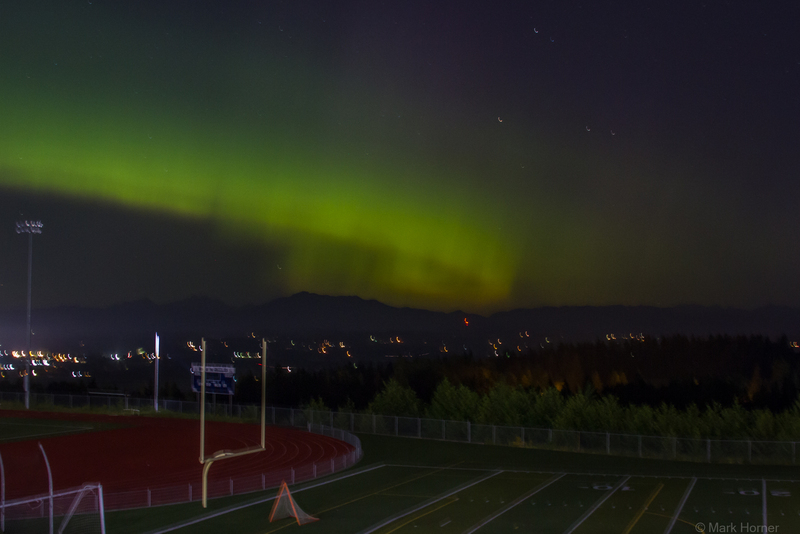 Upon arriving at Glacier Peak High School, it was not obvious to me that the Northern Lights were in plain view. 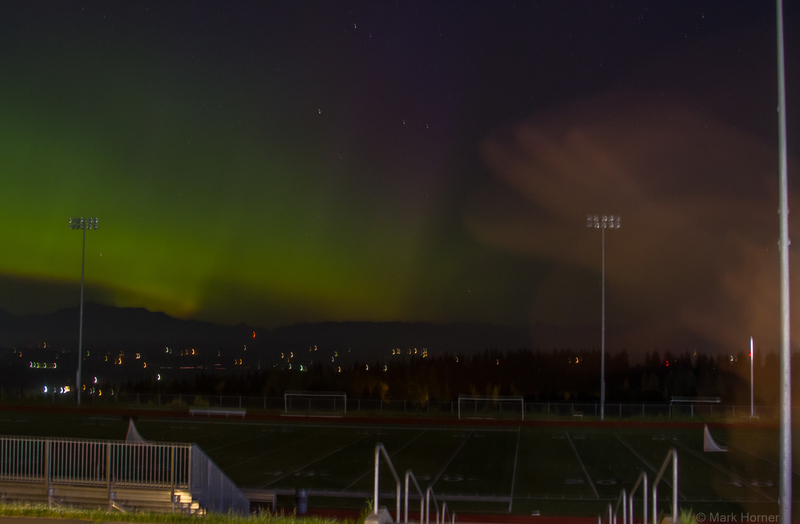 But as I walked up to the area that overlooks the football field and the distant valley below, the lone interruption in a starlit sky appeared as a very long, arc-shaped cloud. 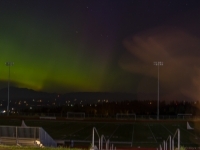 Are those the Northern Lights?, I thought. As I turned on my camera and adjusted its manual settings, my adrenaline intensified. I opted for a 20 second shutter speed, knowing I’d likely get small star trails with the 28-135mm lens affixed to my Canon 7D. My mind quickly raced through my immediate to-do list. Quick, set up the tripod. In a moment, I’d have an image, press the playback button, and see the result on the camera’s LCD screen. 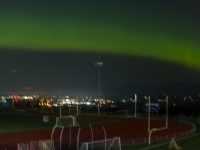 Would the Northern Lights be revealed to me in all their glory? Or would it be a simple—albeit, tremendously large and somewhat rainbow shaped—cloud? The site of so much green in the long exposure image now on the LCD screen left no doubt. 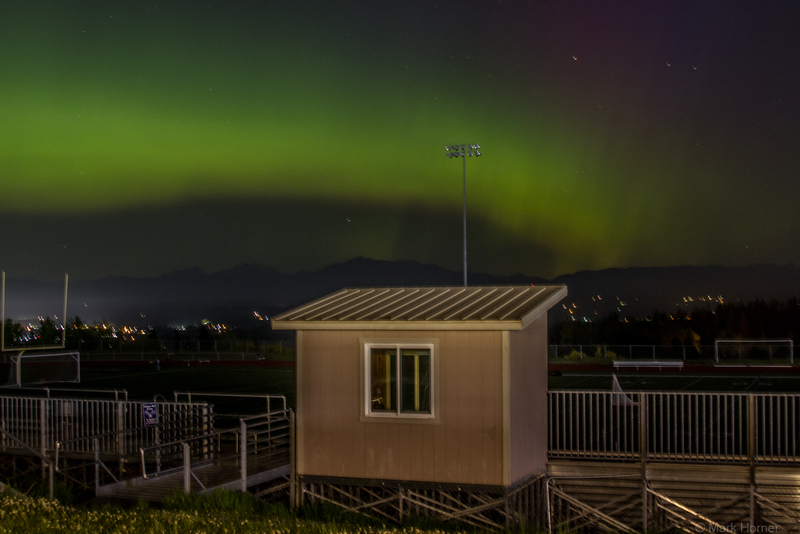 The Aurora Borealis dominated the night sky before me, and appeared to stretch from the west to the northeast. 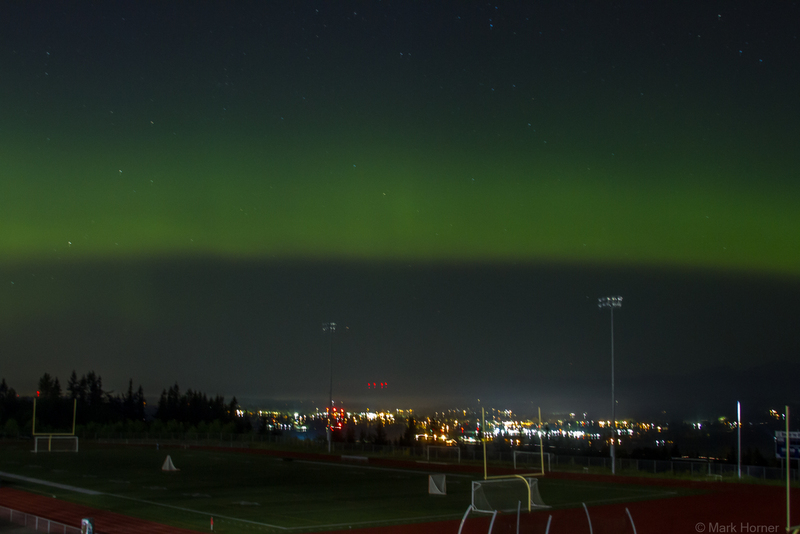 I considered that its green hue was largely obscured from the naked eye due to the area’s light pollution. 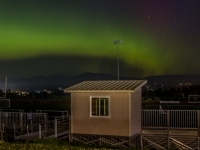 Over the next half hour or so, the Northern Lights seemed to bend, zig, zag, and intensify. 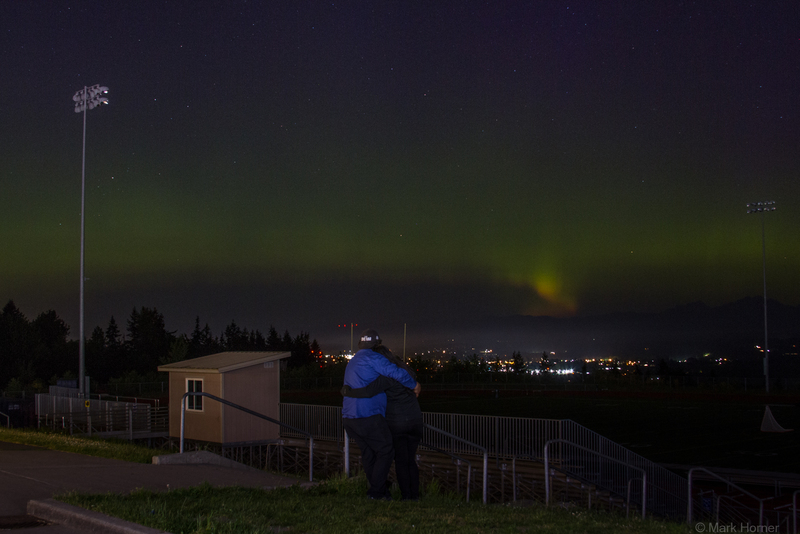 It wasn’t long before a friendly young man and woman approached this same patch of ground above the football field. They explained that they’d been out on the town just prior to visiting the school. “You know, ‘Hey, let’s go visit my old high school and see the changes,'” Victor Gaspar explained. 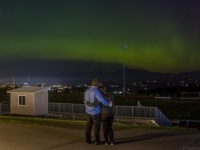 Gaspar, 23, shared that he’d graduated from Glacier Peak High School in 2012. 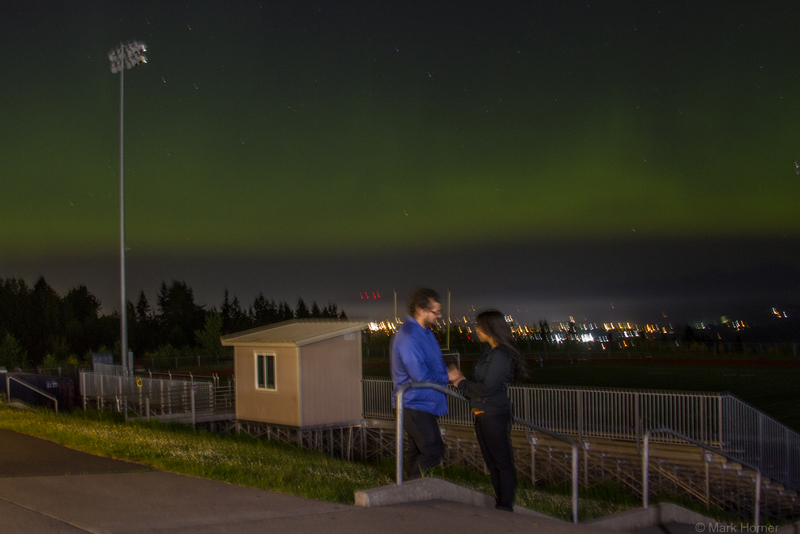 “Yeah, we’re spur-of-the-moment people,” Gaspar’s fiancé, Noelle Fernandez, quickly added. And they had no idea that this moment would have them witnessing something neither had ever seen. Given this set of circumstances, I couldn’t help wondering, What did they think when they saw this dude with a camera alone in the night? So, I asked that question. Fernandez immediately let out a laugh, as if to say, You don’t want to know! I politely prodded her to let me in on that first impression. “That’s fair enough,” I replied with a chuckle. Next, Gaspar offered his first impression. 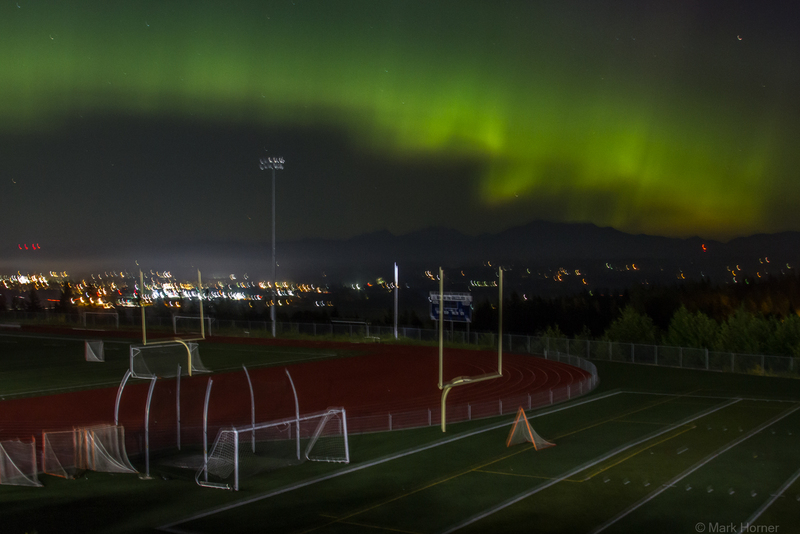 “I thought the school probably hired someone to take pictures of the night and all that’s here,” he said. With the ice now broken, I explained that the Northern Lights were right in front of us. Gaspar would later reveal his first thought in response to my claim. 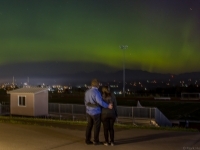 Those can’t be the Northern Lights, can they? I asked the couple if they’d like to see some of the photos I’d just taken. They said they would, so I directed their attention to the images displayed on the back of my camera. 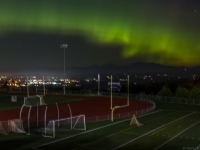 “And sure enough, they were (the Northern Lights)!” Gaspar said. “It’s so pretty,” Fernandez offered. The light show persisted. And I soon returned to taking pictures. It wasn’t long before Gaspar asked if I’d take a picture of him with his bride-to-be…framed beneath the Northern Lights. A moment later, I asked Gaspar and Fernandez if I could take more than one photo of them. 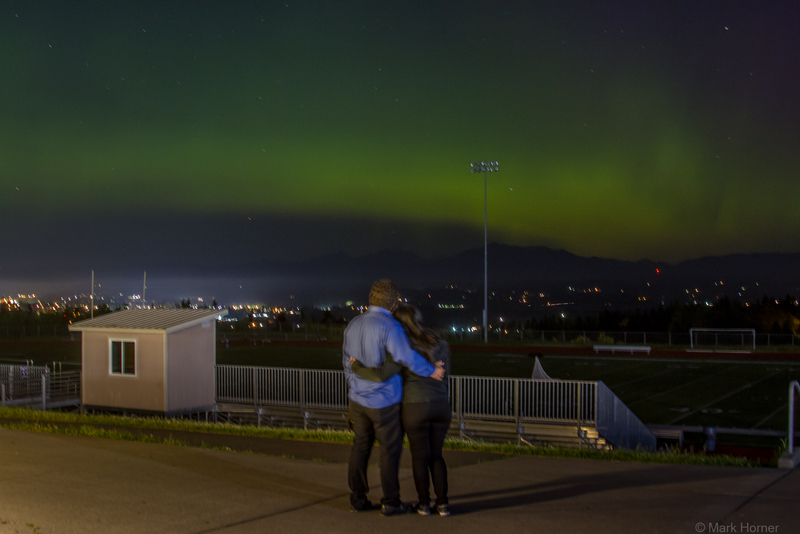 Before parting ways with the young Everett couple, I showed them all 24 images I’d taken on this very early Sunday morning. One image puzzled me; one I was likely to quickly conclude suffered from “operator error” and dismiss. It’s an image I’d normally never consider sharing. 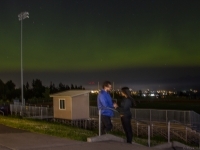 The photo includes a transparent pattern resembling a human hand in the night sky. I don’t recall placing my hand in front of the camera. Not something I’d normally do, but it certainly appears I did so here. You might also see something that appears to resemble a smudge. But it’s this same image that seemed to immediately resonate with Fernandez. She politely asked if she could have this photo, too. “Has your mom passed,” I asked. While that hand-like pattern is almost certainly the result of this photographer’s inefficiency, I don’t think it matters to the young woman who stood beneath the stars on this early Sunday morning. My encounter with Fernandez and Gaspar concluded with the friendly exchange of contact information and mutual gratitude.